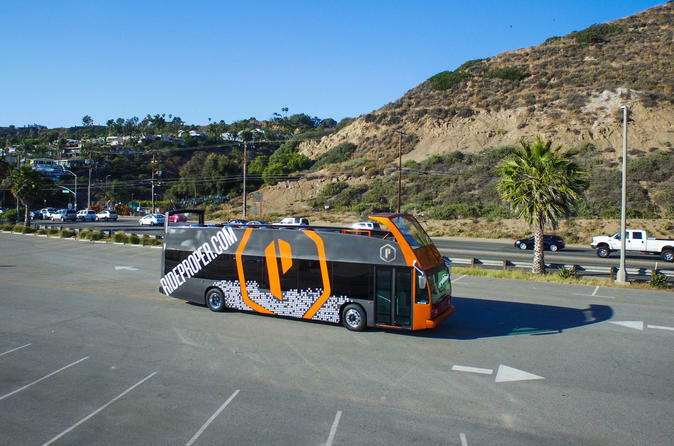 Experience the extraordinary sights and learn the rich history of L.A. aboard our stylish and comfortable hop-on, hop-off, double-decker open-top tour bus. You have the freedom to explore one of the globe’s most creative and expressive cities in a manner, and at a speed, that suits your interests. Hop on and off as much as you’d like with our two-day pass! See the City of Angeles from plush, comfortable seats. Catch glimpses of Hollywood, Beverly Hills, and Santa Monica as our pre-recorded professional tour guide entertains and educates you on these iconic enclaves. Begin your adventure at any of our stops and take your time sightseeing in Los Angeles! The tour bus departs every hour beginning at 10am (Fri-Sun) & 11am (Mon-Thurs) from our Tour Center next to Disney’s historic El Capitan Theater in the heart of Hollywood, located at 6822 Hollywood Blvd, Los Angeles, CA 90028. See the birthplace of some of the greatest TV shows and films, discover the inspiration for some of the world’s most memorable music, and drive through glamorous Rodeo Drive. Sit back and relax in an open-air, double-decker bus where every seat offers an unobstructed view.